While my wife and I were on vacation, or as she likes to call it a bee-cation, I got the call that a bee swarm had taken up home in the second story of the Ladies Village Improvement Society (LVIS) building in East Hampton, NY. I immediately went into action, as I had never removed a hive from a building. Sure I've read plenty of articles about how to do it. I'd pulled one from a privet hedge, but not a building. Step one was to figure out what equipment I would need to get this hive out. 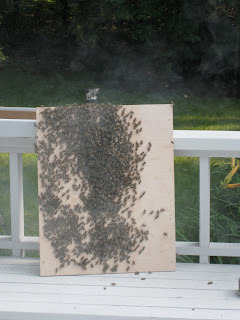 I determined the easiest way after watching some youtube videos and researching on the Internet was to build a bee-vac. I decided on using a shop-vac and combining that with a medium super and a deep hive body. Essentially the medium super has #10 screen across the top of it with the shop-vac hose connecting underneath it. This large screen area helps to reduce the suction on the bees after they are pulled into the deep hive body. From there it was getting up on a ladder and trying to vacuum up as many bees as possible while also determining where they setup shop with their hive. If you don't get the comb out of your house, it'll either attract other bees or it'll melt and attract other unwanted insects. Once the bees were sucked into the bee-vac, I removed all of the comb including the old decaying comb that was up in the soffit. Clearly another hive had once inhabited the area, which upon questioning the LVIS members nobody could remember it ever being there. 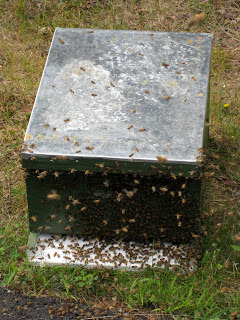 Once the bees were out it was time to transfer them to a nuc box. This was a five frame, waxed cardboard nuc from Brushy Mountain. In the photos below you'll see I shook them into the box and found the queen which I promptly marked with a blue marker. What happened next was not expected. Diana and I went for walk and when we returned they were gone. 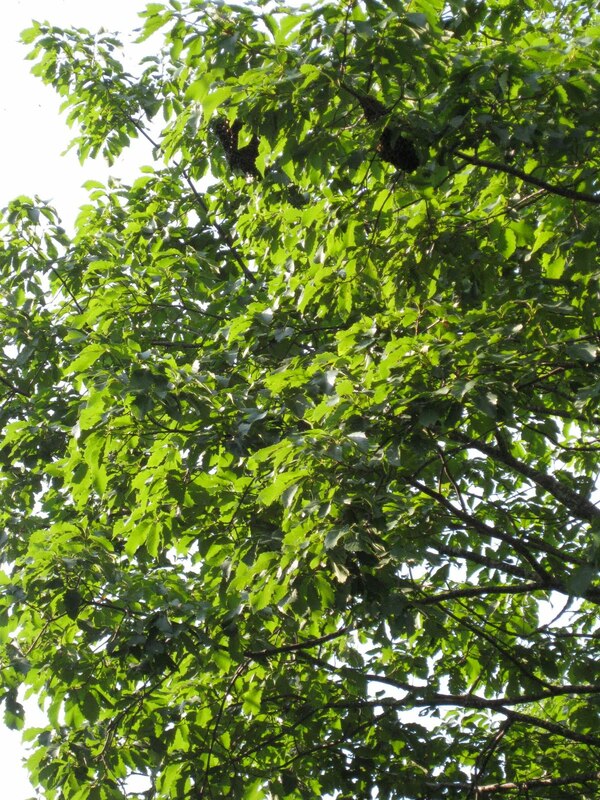 I started to look around to see where they might have clustered. 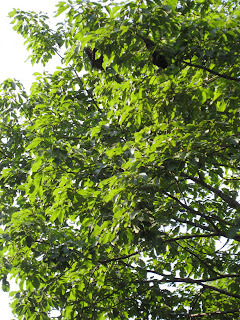 One look up and sure enough they were about 40 feet in the air on a branch of the oak tree above the nuc. I guess they didn't like their new home. 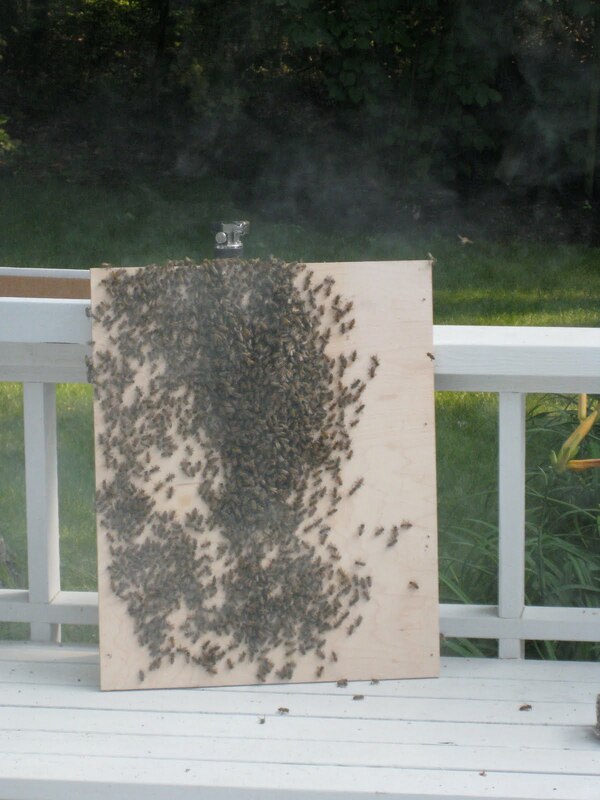 Not having any way to reach them, we went to bed and in the morning I awoke to the swarm taking off. It was the first swarm I ever witnessed taking off. It was amazing- that ball of bees simultaneously burst into a cloud and sounded like an airplane taking off. They seemed to be heading south so I hopped in the car and went looking for them. Sure enough I found them on another tree on a road nearby. I was able to bat them down with a borrowed bamboo pole at which point I grabbed the queen who landed on the road and put her in the large hive body. The rest of the bees quickly followed and I was off with my recaptured bees. I'm happy to report the bees are now safely in their new home and seem to be drawing out comb and filling it with honey. I haven't seen the marked queen, but I have seen a few cells with eggs in them.